Thanks to Ann Falcone of the Village Knitter for this great photo! FiberCamp Boston 2013, Cambridge, MA. Jan 12th and 13th, intro workshop and other awesomeness. Mind’s Eye Yarns, Cambridge, MA: Intro workshops on Feb 17th and March 24th; 2-color advanced workshop on April 6th. The Knitting Studio, Montpelier, VT: Intro workshops on Feb 23rd; 3-color advanced workshop on Feb 24th. 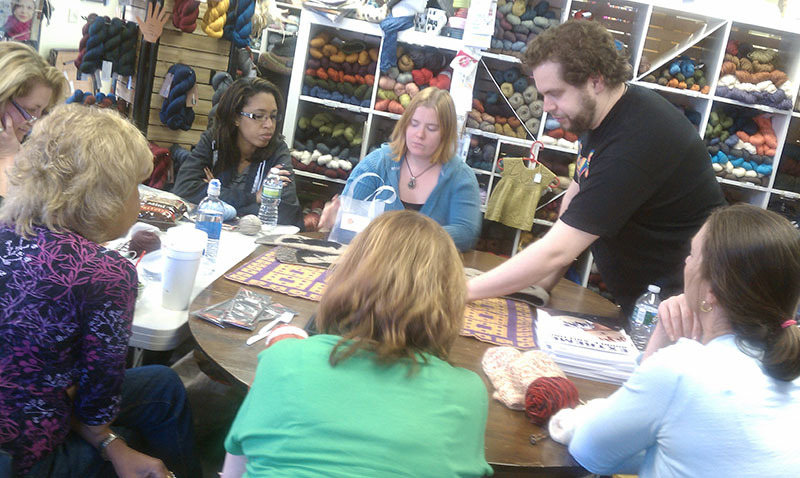 The Yarn Sellar, York, ME: Intro workshops on March 2nd; 2-color advanced workshop on March 3rd. Woolbearers, Mt Holly, NJ: Intro workshop on March 16th; 2-color advanced workshop on March 17th. If you don’t see the workshop you want to take on the shop’s website, don’t hesitate to contact them directly. All shops post their workshops on their own schedules but most have ways of reserving your space even if you get in touch early. Don’t see a workshop in your area? Sorry about that! I don’t pursue specific shops or venues — they have to request me. If you want to get me to your area, send this link to your local yarn shop and ask them to get on my list to find out when I’m scheduling dates for the next teaching season. I am also willing to schedule into the early Summer this coming season, but I find many people don’t want to learn double-knitting in the warmer months. I’m not sure why! In addition to my traditional, in-person workshops, there’ll be a new opportunity for everyone in the whole world to take a class with me on Craftsy, starting sometime in January! This affordable, interactive, online platform allows me to reach worldwide to spread the word about double-knitting to a much larger audience. In addition, I designed two brand-new patterns just for this class, which I’ll post photos of when I announce that the class has gone live! 52 Pickup Kits are now available! In pattern news, the long-awaited yarn is arriving tomorrow according to tracking numbers and those who preordered 52 Pickup kits will still get them before Christmas if the Postal Service cooperates. I’ve got yarn enough to make a few more kits so if you’ve been waiting on purchasing one, now would be the time. Of course if demand is high enough I may be making more kits after the holidays, but I can’t make any promises about precise timing. I’ve also upped the shipping price (for Priority Mail) on the books alone to make sure any new orders still arrive before Christmas; the price will drop again after Christmas to the normal (Media Mail) price. Shipping to Canada is still the same price since I can’t guarantee Christmas delivery anyway at this point. Shipping on the kits is already at Priority Mail levels. But time is running out if you want to get any of this stuff before the holidays, so order now if that’s what you’re after. I’ll always ship the morning after payment reaches me. ← The 52 Pickup pattern book is now available for holiday delivery!